Ultimately, however, the platform for this victory was laid at midfield with Megan Walsh putting in a player of the match performance and getting plenty of valuable assistance from Seren Griffiths. Had Gráinne Mhaols not spurned a plethora of well created chances throughout the opening half, they would have been out of sight by half time. An Cheathrú Rua, in contrast, were far more economical and productive from very limited possession and two points from the boot of Aisling Nic Dhonnacha kept them well in contention. Seren Griffiths countered with an important point for Gráinne Mhaols, right on stroke of half time to leave her side in front by 1-2 to 0-3 at the interval. An Cheathrú Rua were a rejuvenated outfit on the resumption and two quickfire points from the excellent Mary Nic Dhonnacha saw them restore parity within five minutes. Megan Walsh edged Gráinne Mhaols ahead with a close range free but An Cheathrú Rua were temporarily in the ascendancy. The turning point of the match arrived ten minutes from time when Mary Nic Dhonnacha burst through the Gráinne Mhaols cover on a superb solo run only to blast her shot high and wide with the goal at her mercy. This costly miss handed the initiative back to their opponents and Gráinne Mhaols took full advantage by hitting 1-3 without reply in the last five minutes. Seren Griffiths added her second point before Emily McConway blasted home the all important second goal. Herself and Megan Walsh then added the insurance points to put the seal on a well merited victory for the West Connemara girls. 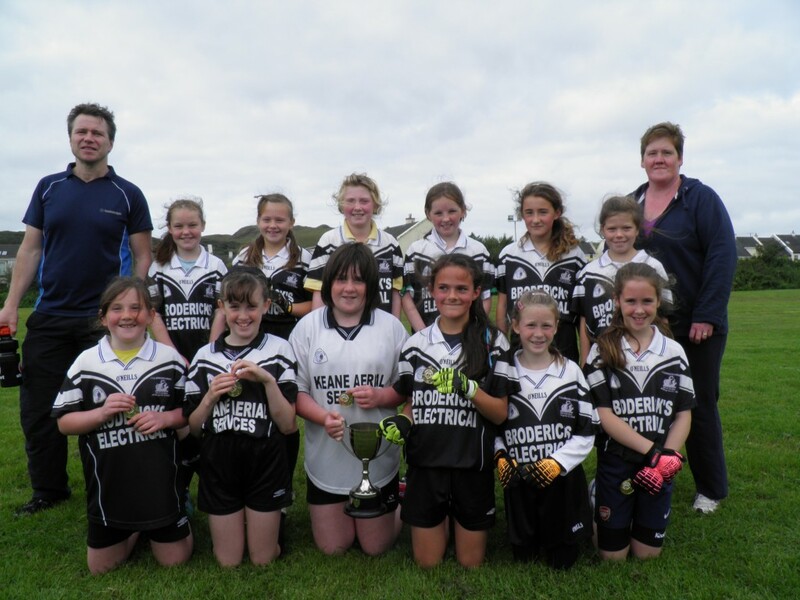 Gráinne Mhaols Captain, Megan Walsh was presented with the West Galway U11A Cup by Peil na mBan Administrators, Philomena Ní Fhlaithearta and Coíl Ó Ceallaigh. 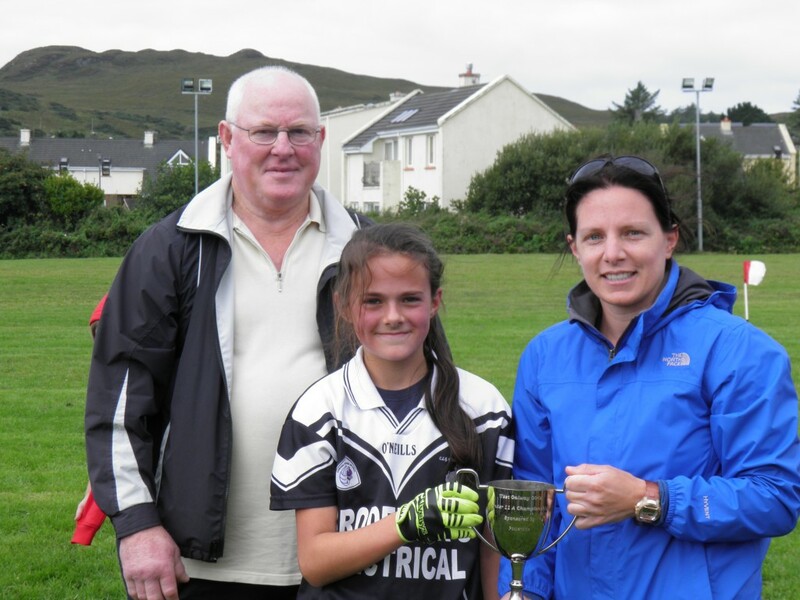 These West Galway U11 championships at A, B, C and D levels have been running since 2008 and are the brainchild Leitir Móir’s Philomena Ní Fhlaithearta, a superb footballer in her own right who has won All Ireland titles with Galway at both junior (2002) and senior level (2004). In her post match presentation address, the Naomh Anna stalwart complimented both teams on the entertaining and very sporting nature of the contest. She also stated that she was very impressed with the players’ command of all the basic skills, notably high fielding and foot passing. “These competitions are developmental in nature,” she added, “and our main aim is to develop the skills and maximise the participation levels. We certainly achieved that today, “she concluded, before presenting Gráinne Mhaols captain, Megan Walsh, with the silver cup.